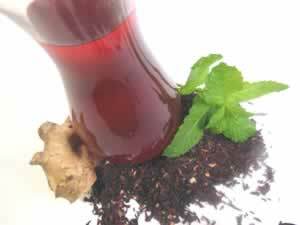 Enjoy this tart, red tea while you help your body burn carbs, get an energy boost, and help to lower high blood pressure. Recipe Instructions: Decoction :Mix herbs and add to 4 cups of cold water. Bring to a boil over low heat (about 15 min), turn down when it reaches a boil. Simmer for an additional 10 minutes. Serve hot or cold with just a dash of honey or low calorie sweetener. Garnish with a lemon balm sprig, or lime slice if you have it.